How will iPads affect data collection in the lab? Imagine working in a lab, recording experiment observations on a lightweight, portable notebook that captures all of your time/date information automatically, takes pictures, seamlessly incorporates equipment data files, and lets you look up references all in the same place. If you imagined a paper notebook, you’ll have realized that vision just isn’t possible. But if what came to mind was an iPad, you are among the growing number of research scientists who recognize how useful one of these tablets can be for your work. Many labs have already jumped ahead and begun implementing them, turning the discussion from if or when iPads will be used in the lab to how they will. A growing number of laboratories, hospitals, and universities are embracing the iPad as an information recording tool in the workplace. A survey conducted by Lab Manager Magazine found that the number of researchers who do now or plan to use mobile devices is already greater than those who don’t. Some industries, such as medicine and pharmaceuticals, have been reporting up to 75% or more adoption. In fact, one university has even given graduating medical students iPads as gifts. While this kind of usage is ahead of traditional research labs, it shows that it can happen and sets examples for how implementation challenges are being addressed. More and more, industry expert lists of pros and cons (or benefits and challenges) are being overcome, with the cons being crossed off and the pros becoming realities. Indeed, in the past year the conversation has moved from whether tablets will be used, to determining the logistics of how it’s going to happen. Price Price is likely still the largest inhibiting factor, but iPads and other tablets are undoubtedly less expensive than purchasing new laptops or desktops for lab spaces. They also have a longer battery life than laptops, and eliminate the need for power cords or LAN cables. Not being tethered to one spot for data entry has huge efficiency benefits. Also as more individual researchers and graduate students get iPads for themselves for personal use, we will likely see them being used in the labs for work more often. Jason Purlow of ZDNet published a recent article iPad at Work: The Essential Guide for Business Users with tips on setting up your iPad for maximum work functionality. “As for durability, most come with warranties that … can have them replaced at a fraction of the cost.” Peggy Weber, Senior Informatics Consultant at LabAnswer, said in a LinkedIn LIMS group. In addition to warranty protection, durable and waterproof covers are available to stop spills and some of these can be used even with gloves on. Writing Some people simply enjoy the experience of writing down notes and other free-writing such as brainstorming or diagramming. These activities are a natural fit for needing a pen-and-paper-like interface. Perhaps one reason the iPad has become so popular is that people can still do those activities by using a stylus or finger with one of the handwriting recognition apps, or use the built in voice-to-text feature which works surprisingly well even with scientific language. Management Approval Another common barrier to technology implementation in traditional labs has always been getting management on board. This is generally true for any new technology, and unfortunately falls less to management recognizing the efficiency and multitasking improvements possible, and more to just waiting it out until everyone else is already doing it. Familiarity As a culture we are experiencing a massive shift towards total computer integration in our lives. Gone already are the days when electronic record-keeping faced the hurdle of lack of computer use. Now, with not just computers but iPads themselves being used in classrooms for education, at the doctor’s office, and home, the technology is becoming ubiquitous to users, particularly among graduates entering the workforce. As these oft-cited challenges to tablet use become less challenging, functionality and practical solutions are simultaneously becoming more available. Perhaps the real value that iPads bring to lab work is in the extraordinary things you can do with one. Beyond simply taking notes, native apps already exist or can be built to supplement or replace many lab activities. And this is just a sample of the apps available, and as iPad use becomes yet more commonplace, it’s exciting to think of what will come. Naturally, hardware protection is a primary concern, not just from spills in general but also for those used in biohazardous, clinical, or other settings where sterility is imperative. Many researchers report simply using Ziploc-style plastic bags, which they can wipe down before and after use. Here are a few other options. The Chef Sleeve disposable iPad cover was originally made for kitchens, but is indicated for use in hospitals and clinics. This TrendyDigital Waterproof Case protects from spills and can be wiped down. This iPad Defender Series case is built for durability and drop protection. Mounts solve that awkward issue of “I have to do something else with both hands now, where can I put my notebook where it won’t get in the way?” while still letting you refer to it as needed. Griffin Cabinet mount – under-cabinet mounts would be perfect for labs where bench tops are usually covered with work materials. FridgePad Magnetic mount – sold as a fridge mount, but there is usually no lack of metal surfaces in labs: cabinets, flow hoods, fridges and freezers abound. 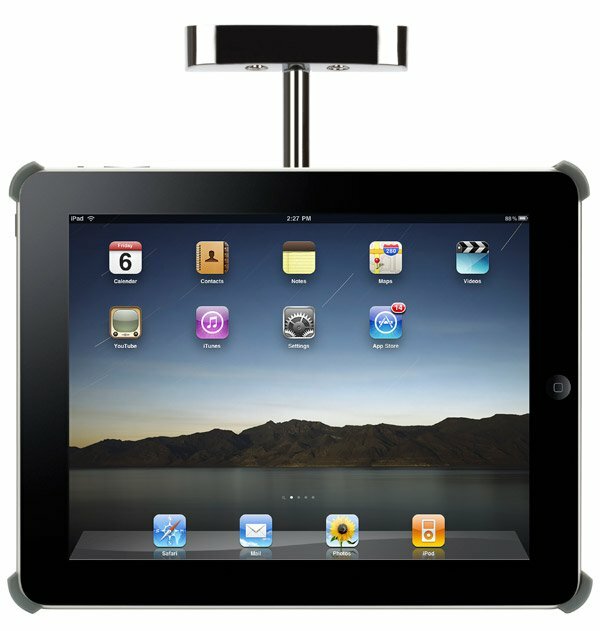 This magnetic mount can be moved around from place to place with you. 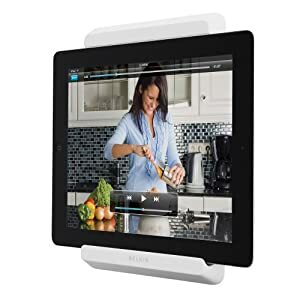 Belkin 3M wall mount – for a slightly more permanent attachment, this Belkin mount uses 3M adhesive strips which can be adhered to any surface, not just magnetic ones. An important usability consideration is the lack of a traditional keyboard for typing. While some users say that they are getting faster at typing directly onto the screen, some still prefer using actual keyboards. Luckily, accessory producers are already meeting that need. The TouchFire iPad Keyboard is a silicone overlay that is placed right on the screen’s surface. It provides the 3D responsiveness that people are used to, without needing an extra piece of hardware. What are your thoughts on iPads in the lab? Let us know on Twitter!